How Can I Create a Vision Board? You can either cultivate someone’ else’s dreams or use the opportunity to cultivate your own. The choice lies with you, my friend. 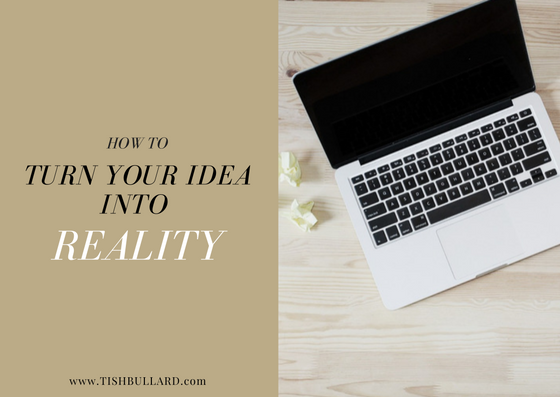 In this post, I will share with you 12 things that can help you get the courage to see your idea through. You will be your biggest cheerleader in this journey of birthing your idea. And, it will require you to take action. No one else will have the responsibility of seeing your vision through like you will. You, my friend, will have to hold yourself accountable and be dedicated to your work. Don’t allow the unforeseen or the thought of failure paralyze you. Now, please hear me, everyone will not be your sounding board! Seek those that have done something similar to what you are doing. Enlist a mentor who will encourage you and offer you wisdom from their failures and successes. And, always evaluate any advice given. It’s important to know that risk will be involved. Accept the risk. This may be the scariest part of entertaining your idea. 4. Don’t be in a hurry. Reaching for the stars won’t be done overnight. It’s difficult to work hard for a period of time and not see the fruits of your labor, right? Pace yourself and know that pushing your idea from concept to reality will take time. The results that you are seeking follows patience and commitment. Just because you don’t see results right away doesn’t call for you to quit. Be careful of who you let into your inner circle. Sharing your purpose and ideas with the wrong crowd or person can hinder your journey causing you to slow down and restart. Find ways to help others understand your vision. You should know the why, what, where, how much and the who that is involved with your idea (your purpose) before successfully selling (pitching) your idea to others. Make it easy for an outsider to understand your idea. 6. Don’t ignore everything around you. This is basically a game of connecting the dots. Open your mind to identifying the clues that the world gives you. Your main idea may actually mature into something bigger and better than you can imagine. And, the inspiration to enhance your idea is all around you. You must be enthusiastic about your idea. The passion will come from you, not anyone else. If you aren’t passionate, your idea may be short lived. 8. Have purpose behind your every move. Set intentions surrounding your idea with meaning and purpose. And, attach yourself to your purpose. Each action that you take towards getting your idea into the world will have purpose. Purpose fuels your passion even when your journey becomes lonely. And, when you have a purpose to fulfill, you will want to be consistent in your actions. Create purposeful and meaningful relationships. Relationships in your community and with others in organizations and business will be a vital role in your idea birthing. Nurture relationships and allow them to be resources to you in various stages of your idea creation. Have laser focused vision to keep you staying true to your plan. There will be a lot of shiny objects and situations that will tempt you to pay attention to them but be aware. Stay clear of the shiny object syndrome and stay focused on your purpose, your dream, and your plan. Manage your time wisely. And, don’t over commit yourself to projects and activities that will distract you. 10. Always make room to improve your idea. Don’t be complacent and “stuck in your ways” with your idea. Challenge yourself to think beyond your original idea and see the possibility of how much it can grow. Constantly seek ways to improve your idea. 11. Someway, somehow create a work/life balance. Your idea’s success is a marathon, not a sprint. Don’t try to create your entire infrastructure or product collection in one day. Definitely give yourself a timeline that includes a deadline but also allow time to rest and seek ways to refresh your mind and body. Nurture the personal relationships around you. Try not to overwhelm your mind and body by constantly working and not finding time to enjoy life. Your idea can grow into something big and much larger than you expected. Embrace that and celebrate it. You have to give your idea life at the very beginning and work hard to keep it alive forever. Meditate and pray about your idea. Seek guidance from the Almighty on your next steps to take and about resources that you may need. Here’s to a beautiful journey of sharing your beautiful ideas with the world. Let me know if this post helped you in anyway of getting “unstuck”.